Better late than never, right? If you have been waiting for Samsung’s Windows Phone entry in the US, it is possible you will not be waiting much longer. 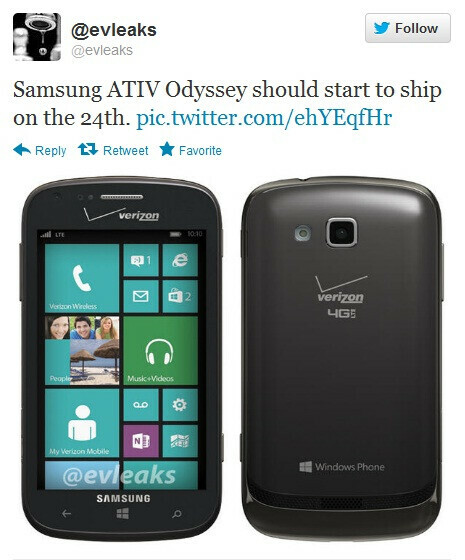 The Twitter leakers @evleaks passed along a tip that the Samsung ATIV Odyssey will be available on Verizon January 24th. The 24th is a Thursday which is a common day for new devices to be available in the corporate stores. We got to take some hands-on time with the ATIV Odyssey at CES and while the device has specifications that are marginally below the Nokia Lumia 822, the Odyssey is tidy little device. Its 4-inch screen and form factor makes it comfortable to hold and use with one hand. The Odyssey has a nice sized battery too, which means that this Windows Phone entry is going to be a capable handset for anyone who uses it. With a 5MP camera, 4-inch screen, 2,100mAh battery and Windows Phone 8, we think the ATIV Odyssey will price for free on a two-year contract with Verizon. UPDATE: Verizon announced today that the Samsung ATIV Odyssey will indeed be available in stores and online starting tomorrow the 24th. Verizon also announced the subsidized price point for the ATIV Odyssey and a two-year agreement: $49.99 after a mail-in rebate. That takes us a little by surprise given how the specifications of the device line-up against the other Windows Phone offerings available on Verizon, especially the Nokia Lumia 822. However, its 4-inch screen, slightly larger battery and overall shape make the ATIV Odyssey a little more pocketable, and that may find appeal with a number of consumers along with the Samsung name as well. Is the Samsung ATIV Odyssey on your list? For some reason a 4" screen seems so 2010. Especially when *NEAR* edge-to-edge screens start to catch on more. If this is the 'new and wonderful' news that was about to pop, it is more of a let-down. A pop, but not the positive kind. More like a balloon being burst. 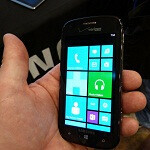 Nokia is the one that signed that crappy exclusivity deal with AT&T over the 920. As a Verizon customer I'm not going to jump up and leave over one phone. If that was the case I would have been using a AT&T iPhone since 2009. I don't think Android would be this strong if Apple released the iPhone on all carriers in the very beginning. Nokia is repeating the same mistake. Nokia is going to rue the day they signed an exclusive on the L920. Yeah, I think the exclusivity deal left a HUGE void at all other carrier. I would like to believe Android could have made it to the top on its own merit, but with the iPhone on every carrier, that would have been extremely difficult. played with this phone.. it really impressed me compared to verizon's nokia and I carry the htc, you guys might change your mind playing with it. Which is why the carriers are not willing to make volume commitments on WP. Neither are any manufacturers really, besides Nokia.